It is not just the players that have been affected by the NHL lockout. Officials have already handed out five-minute majors and game misconducts, while the league, most notably disciplinarian Brendan Shanahan, have thrown the book at some players, resulting in fines and suspensions. With any punishment (or lack thereof) comes scrutiny and deliberation from outside parties. Questioning the rulings of the league is as much a part of the game as cowbells and goalie chants. The latest week of discipline has left many people scratching their heads. Take an instance that occurred last Tuesday night in Pittsburgh. New York Islanders forward Colin McDonald chased down Penguins defenseman Ben Lovejoy behind the net. He followed through on a check that sent Lovejoy’s face into the glass, resulting in Lovejoy falling to the ice, appearing injured. McDonald was assessed a 5:00 major penalty for boarding and was given a game misconduct. In Shanahan’s video explanation, he says that McDonald was “all the while looking at Lovejoy’s numbers” and “then recklessly” drove Lovejoy into the boards “with great force.” McDonald was handed a two-game suspension and forfeited $7,567.56 in salary. Sunday morning, Lisa Dillman, Kings writer for the LA Times, reported that the league will not hold a hearing for the Stoll hit. Are you scratching your head yet? If not, this one will surely leave you confused. Friday night, The Detroit Red Wings played host to the St. Louis Blues at Joe Louis Arena. 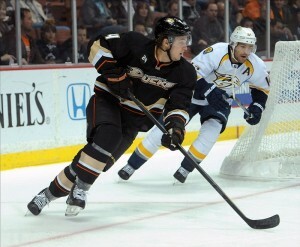 Much like the Ducks and Kings, controversy seems to arise after every meeting between these two teams. This night was no different. With the game tied 3-3 around the middle of the third period, newest Red Wings defenseman Kent Huskins carried the puck to his team’s blue line. Blues Captain David Backes came in from Huskins’ right and delivered a check to the veteran, knocking him to the ice and sending him off the rink with what appeared to be some type of foot or leg injury. The referee behind the play called Backes for an illegal hit to the head, which carries a 5:00 major and a game misconduct. This also carried a match penalty that usually results in some type of supplemental suspension. 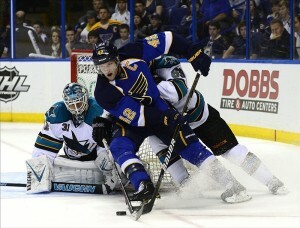 The replay showed that Backes hit Huskins in the right arm and in the chest, never making full contact with his head. Red Wings forward Pavel Datsyuk scored on the ensuing power-play, leading the Red Wings to a 5-3 victory. The next day, the NHL announced that the match penalty would be rescinded; this means that Backes could not be suspended for the hit. The NHL has seen plenty of controversy over their rulings, but this season already seems to be giving fans and players more fits than usual. The season is just over two weeks old and we have already seen a plethora of misjudged hits on the ice and suspect punishments handed out by the league. The claim can always be made that the league should better train their officials. The problem with this is that we don’t know what these on-ice disciplinarians are going through already. I expect that the league has a vigorous training program in place for officials before the season starts. After all, this is the best league in the world; the front office is expected to employ the best people possible for these important jobs. The only thing that can be done is for players, coaches and fans to be patient. We have seen a league-wide increase in offensive production on the power-play; this is likely because the team defense aspect of the game is lacking due to the added time off to the off-season, accompanied with many players still adjusting to the new look of interference penalties. The same can be said for the NHL officiating. In the past, referees have the tendency to become more lenient as the season progresses. 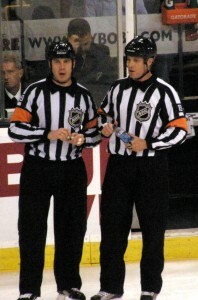 Remember that these guys are employed by the NHL; they were kept off the ice from the months of October – mid January. They couldn’t go to Europe and work like the players did. Perhaps the same can be said for the league office… although not likely. The hope here is that if the officials are better on the ice, the NHL front office will follow suit. With the rocky start to the 2012-13 season, it appears that the only way is up for the entire NHL disciplinary system.